Is the USM Higboard L available in different lengths? The configurations shown here are only examples, USM furniture is modular and therefore offers limitless individual solutions. Can doors be retrofitted at a later date? The installation of doors can be undertaken at any point. 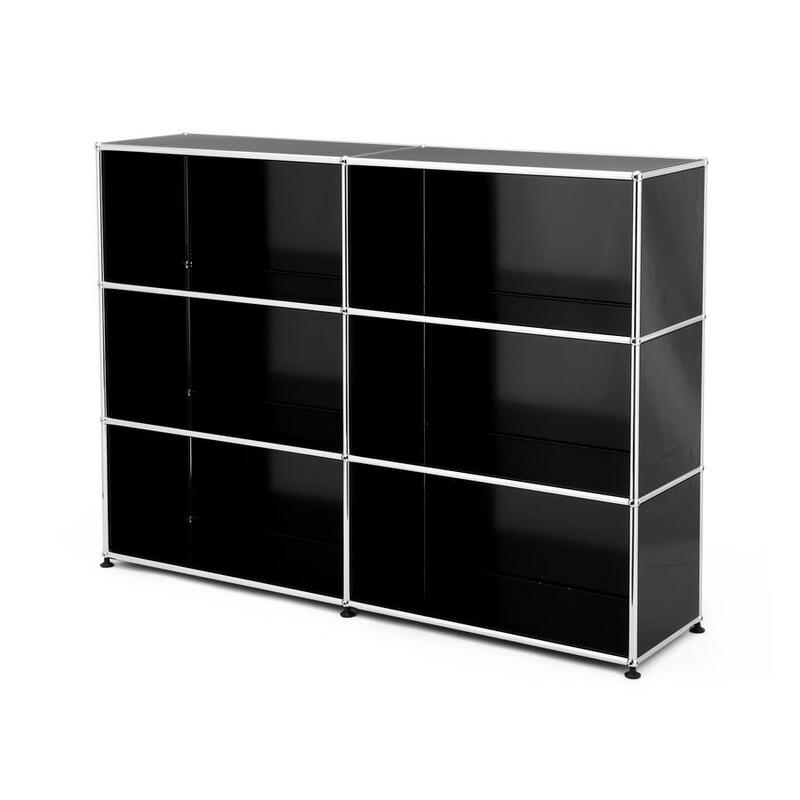 Can the USM Highboard be moved by one person? No, on account of the dimensions and weight moving the furniture requires two people. The design of the USM office furniture is characterized by its uncompromising realisation of a function-oriented approach. Thanks to the simple basic structure consisting of steel tubes, panels and brass balls, the modular furniture system allows the construction of complex and individual furnishing solutions. 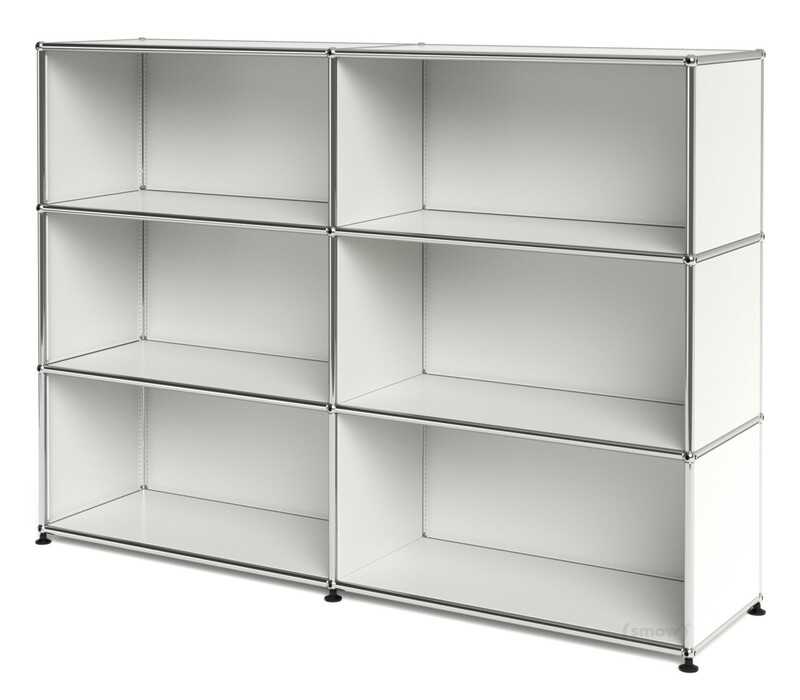 The USM Highboard L with six open compartments is one of the classics of the multifunctional shelving system. 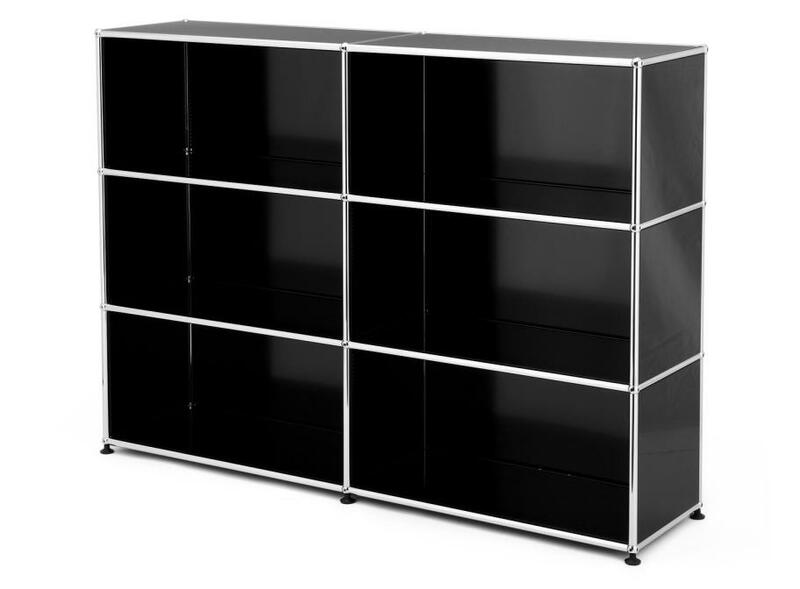 In addition, the USM product range includes the USM Haller mobile container and the USM Haller table collection. Characteristic of USM Haller furniture is its functional focus, but they also present a stylish and elegant solution for interior decoration be that in office or domestic situations. 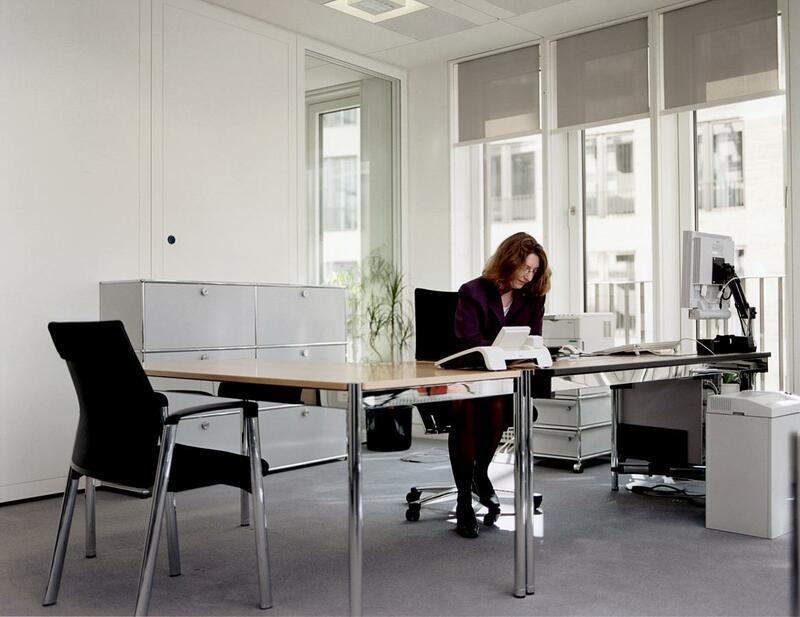 Originally developed by USM for their own use, the USM Haller modular furniture system has become a genuine international classic, and one that has moved from being an almost exclusively office furniture product to one that is now very popular in homes. Born in 1924 in Solothurn, Switzerland, Fritz Haller first trained as a draughtsman before moving on to architecture. 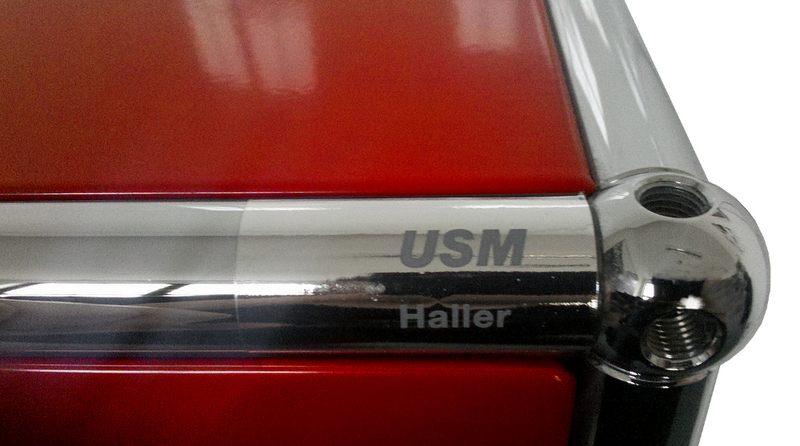 working in an unashamedly functionalist style Haller planned and built numerous schools, workshops and office buildings, including in the early 1960s new production and administration buildings for USM. 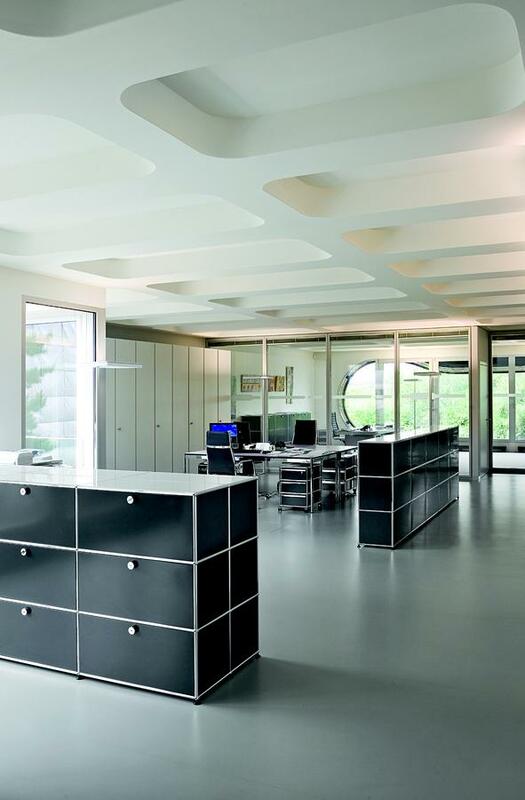 Upon completion of the office pavilion USM owner Paul Schärer commissioned Haller with planning of the interior. In this context Fritz Haller developed in 1963 the USM Haller modular furniture system, a system which now belongs to his most popular works. 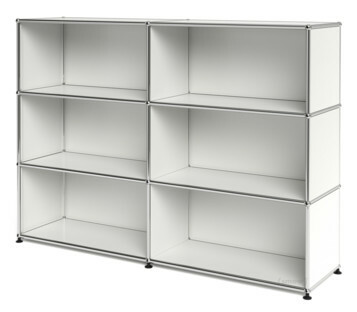 For the shelving system USM Haller has received many awards and is represented many museum collections, including the permanent collection of the MoMA in New York. Following his the cooperation with USM Fritz Haller taught at the universities of Karlsruhe and Stuttgart. 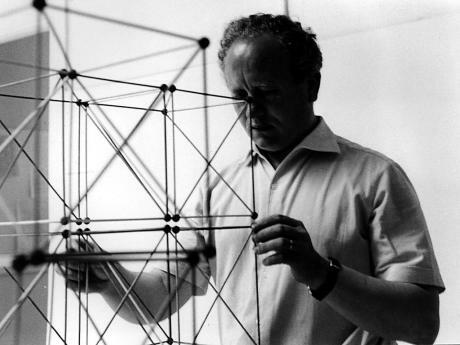 Fritz Haller died in 2012 in Switzerland. 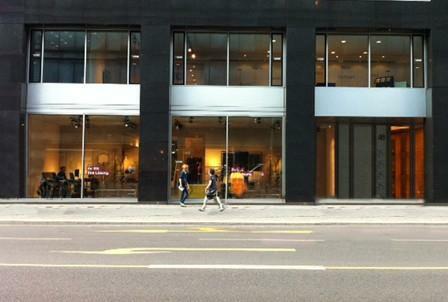 The company USM was established in 1885 in Münsingen in Switzerland. 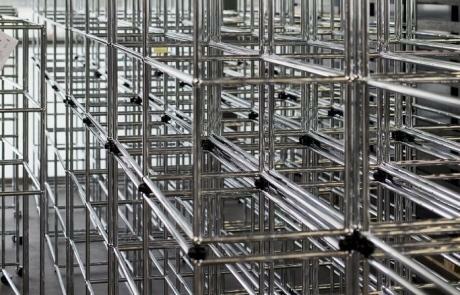 There all components of USM furniture are still manufactured. Components for objects intended for the German market are transported to USM Haller's production facility in Bühl, Germany. Through focusing on only central production site the company not only guarantee a constant level of consistent quality but also reflect the ecological responsibility of the USM Haller highboards, sideboards and all other USM units and mobile cabinets. In addition through the use of high quality materials and the systems modular durability USM units have a very long product life cycle which also increases the products environment credentials. Strictly speaking the USM Haller story begins in 1885 when Ulrich Schärer founded a hardware store and locksmith firm in Münsingen near Bern. In 1920 USM added the fabrication of window fittings to its repertoire before in 1946 expanding to include general sheet metal production. In 1961 Paul Schärer, grandson of Ulrich, commissioned local architect Fritz Haller with the construction of a new USM Office Pavilion in Münsingen, and two years later asked him to develop a matching interior. 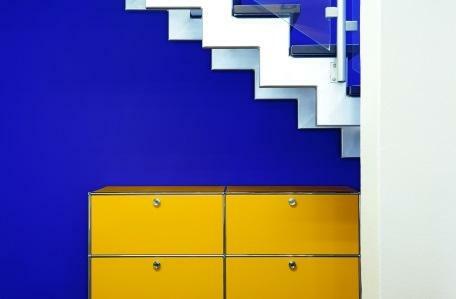 And so it came to pass that in 1963 Fritz Haller developed the USM Haller modular furniture system. Six years later the system enters serial production: and no one has looked back since. 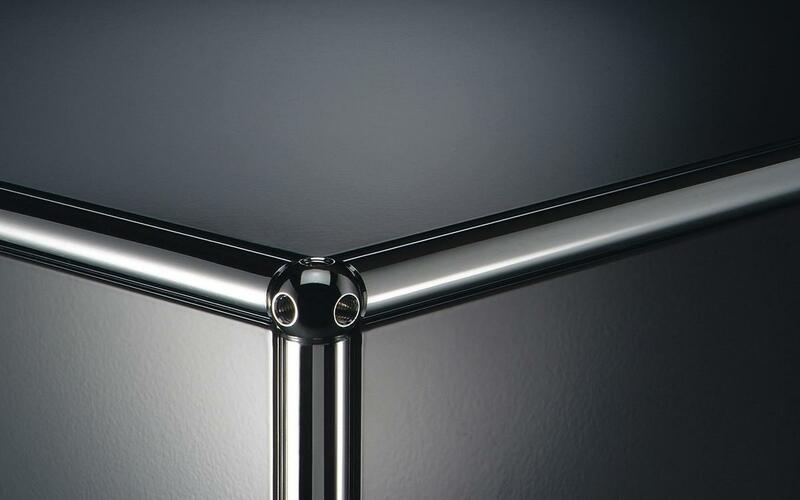 In subsequent years, the shelf system quickly became the main pillar of the Swiss company, and consequently since the early 1990s USM have focussed exclusively on the production of the steel furniture system. 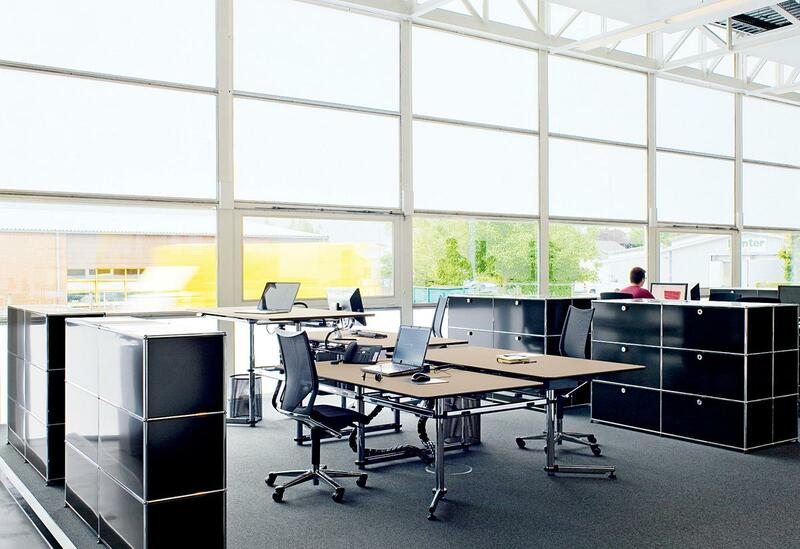 Through flagship stores from Berlin via Tokyo to Paris USM have underscored their position as one of the world's most successful manufacturers of office furniture. 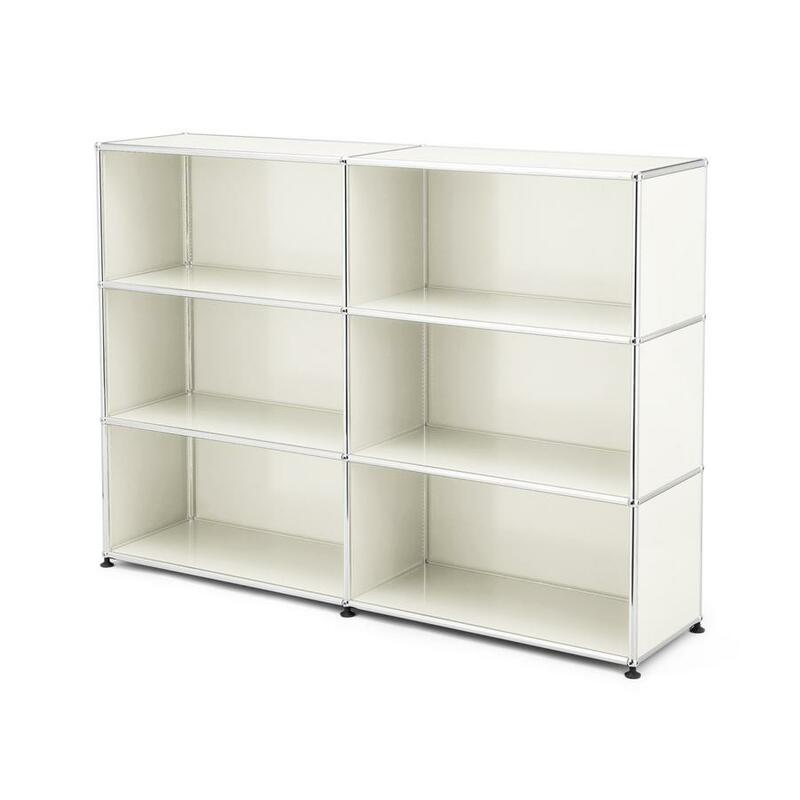 In terms of design history the USM Haller Highboard L is most easily associated with functionalism and the famous quote "form follows function" by Louis H. Sullivan. Already popular at the time of Bauhaus the functionalist approach dictated that the beauty of architecture and design be defined by the clear functionality of the object. The USM Haller furniture system meets this target in a special way: it offers individual solutions for many different requirements and its minimalist and elegant aesthetic results from the reduction in functional aspects. Precisely for this reason the design of the USM Haller furniture transports a timeless charm that makes it suitable for both the office and domestic situations.